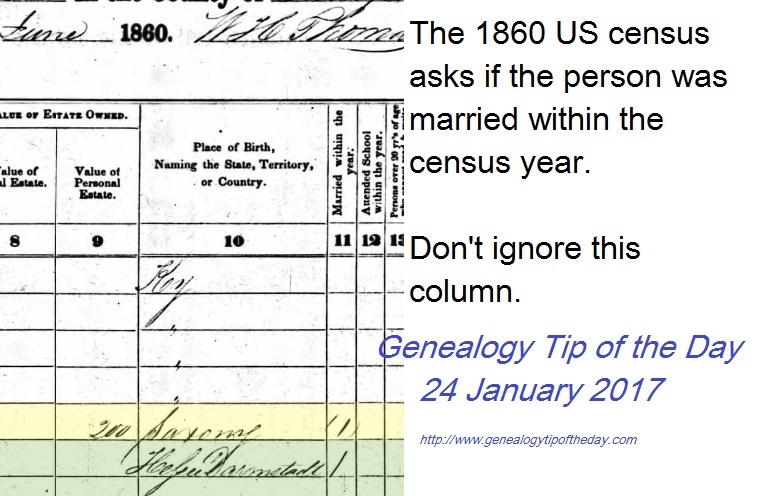 The 1860 US census asks if the person was married within the census year. It can be easy to overlook this column, particularly if the person is someone you don’t think would have gotten married during the census year. 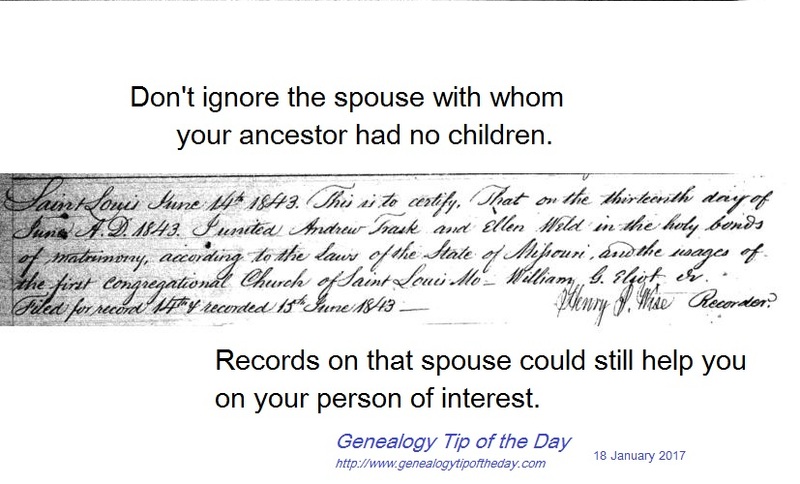 This can be a significant clue, particularly in locations that do not have marriage records. 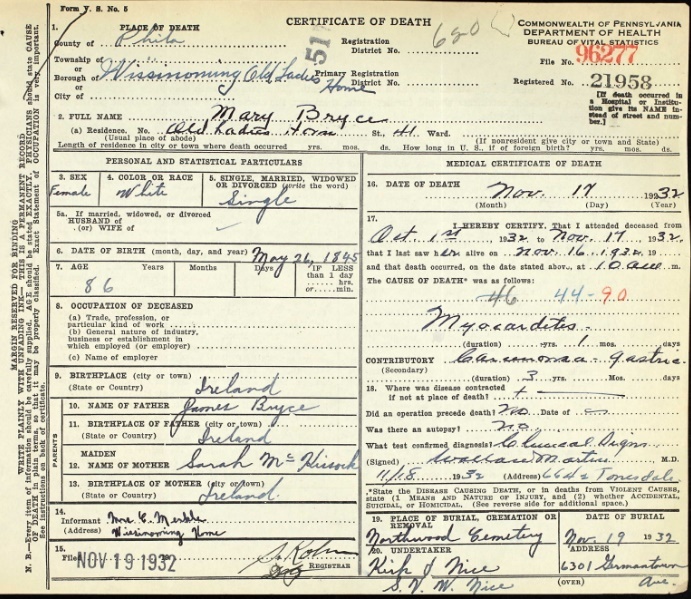 This 1932 death certificate from Pennsylvania clearly has been filled out by more than one person. The handwriting and ink are not consistent across the document. Do you always consider that more than one person may have provided information for a record? The handwriting doesn’t even have to be different for more than one person to have provided the information-it just means that one person wrote down all the answers. Registration ends at 6:00 pm central on 26 January 2016. See below to register. Date: 28 January 2017–2:00 pm central. Session hosted via GotoWebinar. Citation does not have to be a dreaded part of research. See how it can actually help and strengthen your research. Registration limited. Handout included. Are You Mentioning Unnamed Persons? when using your own memory as a source–include your name. And never refer to people as just Aunt Brenda or Uncle Horace. Use complete names. 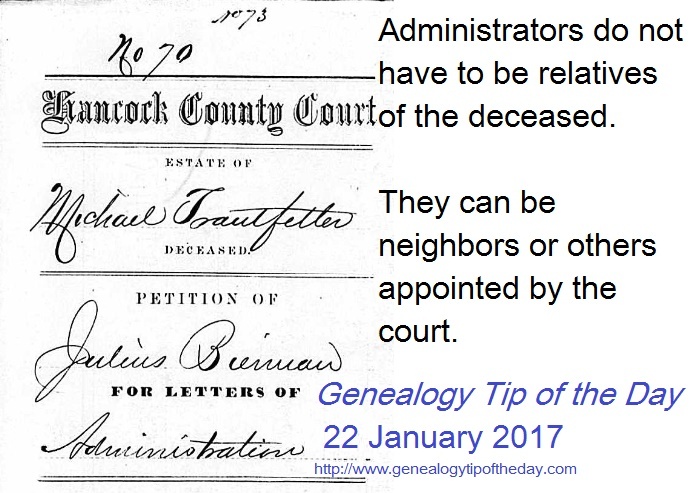 Administrators do not have to be relatives of the deceased. Do not assume there were no relatives living nearby if a “non-relative” is appointed to administrate the estate. Administrators can be neighbors or others appointed by the court. In some locations relatives (including the spouse) may have to sign a waiver giving up their preferential right to act as administrator. The estate of Michael Trautfetter from Illinois in 1869 (shown in the illustration) was administrated by Julius Bierman. 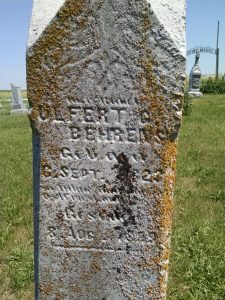 Bierman had no relationship connection to the family. Citing sources frustrates some researchers. They worry about format, style, and the appropriate placement of punctuation. Don’t fret over such things. As we will see your concern should be over your cousin in Santa Fe. Purists will frown at these citations. Let the the frown lines be their own reward. Are there a few minor details missing? Yes. Is it better than no citation at all? Yes. Those who quibble over the precise comma placement will roll their eyes. Let them roll their eyes til their sockets wear out. Your cousin from Santa Fe who encounters your file will be glad you went to the trouble. 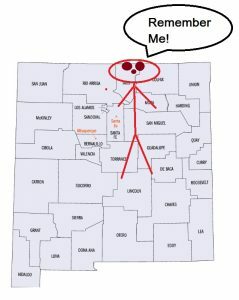 Worry about your cousin in Santa Fe. The purists and the quibblers will always be with us and are difficult to please. Leave them to their frowning and eye rolling. 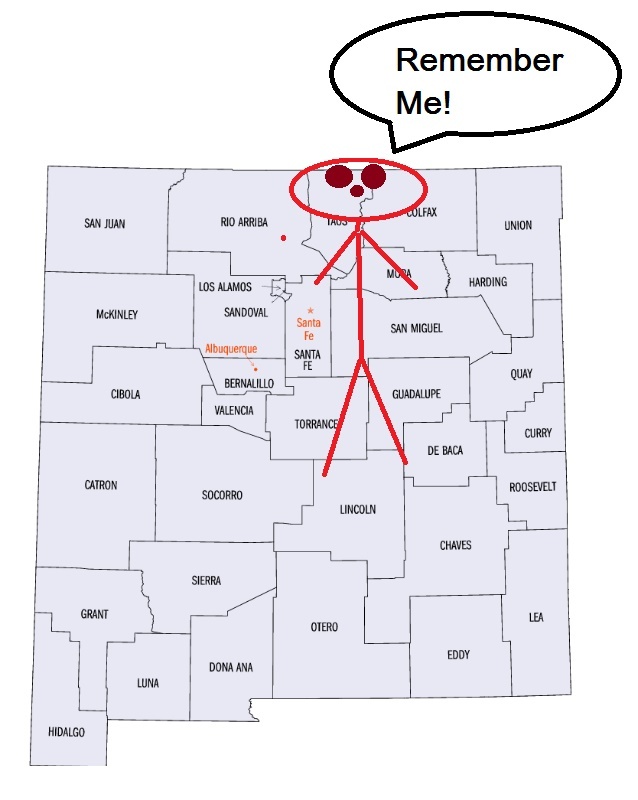 Your cousin in Santa Fe will find your citations a cool breeze refreshing their research frustration. Remember your cousin in Santa Fe. Regularly learning something new generally will help your research. The names of some locations may be informal and only exist in the minds of local residents. Official location names may be used in legal and other documents, but newspapers (particularly “gossip columns”), family letters and less formal materials may refer to places by names used by the locals. 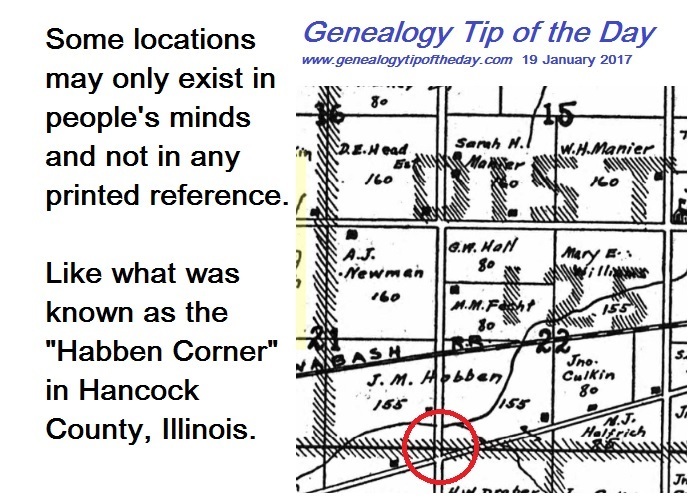 I know where the Habben Corner was and where the Meadow Slough south of Carthage, Illinois, approximately is, but these location names won’t appear in any gazetteer or geographic directory. Local libraries, historical/genealogical societies, or “old timers” may know the places to which these unofficial names refer. 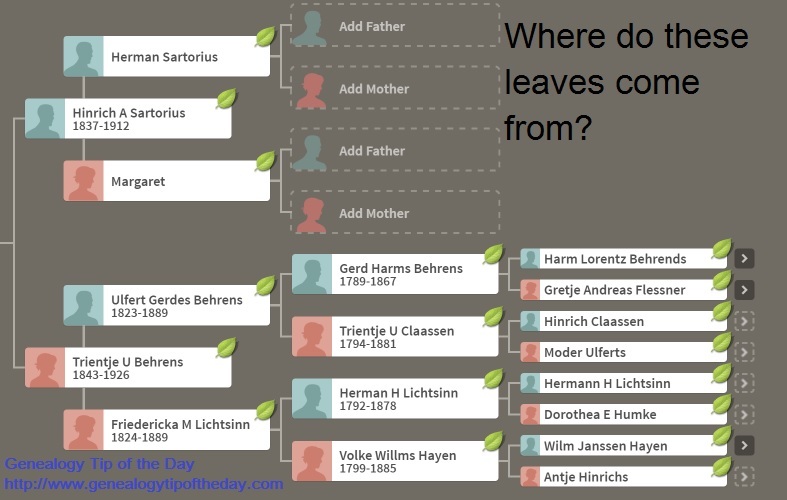 Where Do the Leaves Come From? links other people have made in their own trees. That is, you link an 1880 census for Hinrich ReallylongnameIcannotspell. 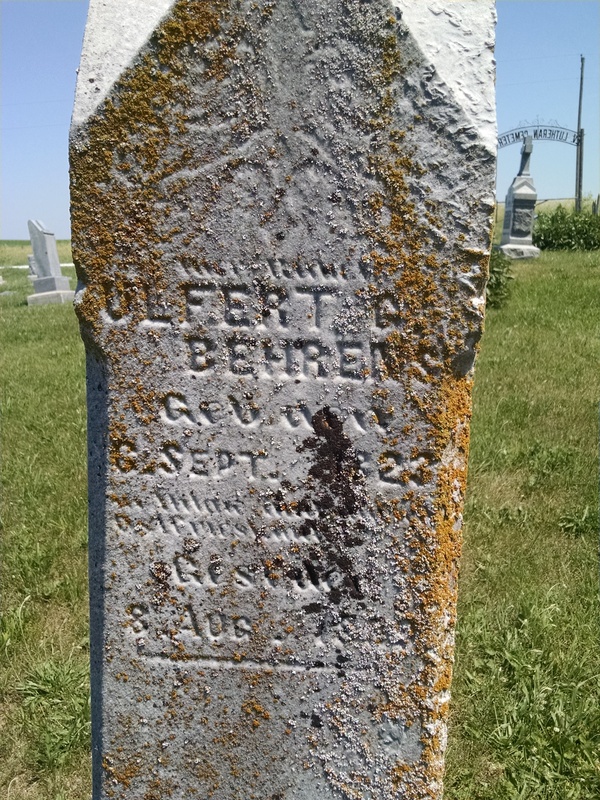 Another person who has linked that 1880 census entry to their tree’s entry for their Hinrich links that Hinrich to an 1870 census record for Hinrich ReallylongnameIcanspell. You may get a “hint leaf” suggesting the 1870 census record for Hinrich ReallylongnameIcanspell when you find the 1880 census record for Hinrich ReallylongnameIcannotspell. search results based upon broad searches for information in your database. 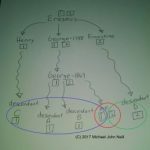 My “practice” online tree is online at Ancestry.com. I’m not exactly certain what brought Andrew Trask to St. Louis in the 1840s, but shortly after his arrival he married Ellen Weld. She died shortly after the marriage and he married again and had all his children with his second wife. Research has focused on the second wife, because that’s the one with whom he had children. Clues as to Andrew’s origins could like in learning more about his first wife and his first marriage, particularly as it took place shortly after he arrived in St. Louis. 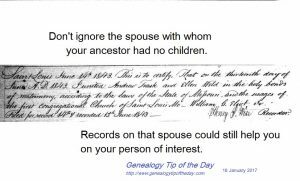 Don’t ignore ancestral spouses that left no children behind.